There is no magic in the OECD leading indicators this month. Yet, there is some positive momentum in play. 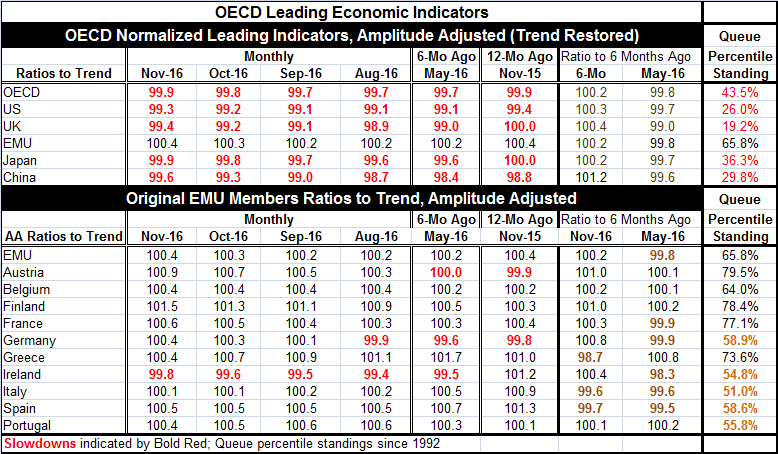 The OECD likes to look at these indicators compared to six months ago so we provide a view of six-month changes and levels in our table and on that view LEIs disappoint. On a six-month view, only the EMU region is stronger than it was six months ago. The overall OECD LEI gauge is weaker, the U.S. is weaker, the U.K. is weaker, Japan is weaker and China is weaker. Comparing the level six months ago to the level six months before that, we find weakening trends all around. The chart shows some near terms bottoming and rebounding, but the six-month changes still show nothing good. There may be some rebound 'in train' that will show up the six-month comparisons within the next month or so, but that is speculative and for now that is not a reliable concept. The EMU still generates a modest positive signal over six months, but it is relatively fresh. It does not generate a positive signal for the period six months prior to that. Still, within the EMU, of its original members, seven show positive advances over six months, one is unchanged, and only two show slippage on balance over six months (Germany and Ireland). Five countries have ongoing positive signals with acceleration indicated for the six months before that as well (Austria, Belgium, Finland, Greece and Portugal). That list is heavy with the presence of countries that have been under the yoke of austerity or otherwise struggling. It is a hopeful sign that they are shaking off the rust and not a sign that growth is moving up into a higher gear. The table also produces rankings of the levels of the OECD indicators. The levels still show all the major countries/regions with below normal levels except for the EMU. On a queue ranking basis on levels of the LEI indices back to 1992, all the major regions stand below their historic medians with the exception of the EMU which has a modest 65th percentile standing. Within the EMU, the original members all have standings above their midpoints on this timeline. Five members have rankings that stand only somewhere in the 50th percentile but short of the 60th a modest standing above their respective medians. That cohort of modest readings includes three of the four largest EMU economies: Germany, Italy and Spain. The second largest EMU economy, France, has a 77th percentile standing. None of the EMU original members has a standing as high as its 80th or 90th percentile. Austria, Finland, France, and Greece have readings in the decile range of the seventieth percentile. While the EMU is doing better than most other countries/regions, it is doing so on the back of some very accommodative ECB policies. Yet, those policies are creating overwhelmingly supportive growth in no sector or country. Because of rising oil prices, voices are now beginning to call for the ECB to step back from its monetary stimulus policies. Whether that has an impact on growth or not is something to be kept apprised of. Is it time for the ECB to step back or would that be a mistake? German members of the ECB are quite vociferous about the idea that it's time for the ECB to back off. On other gauges, the German economy looks hotter than it does under the lens of inspection offered by the OECD gauges. And Germany is even showing hotter inflation than the EMU as a whole and Germany is especially sensitive to this sort of heat. In the U.S., the move to higher rates may have finally begun in earnest as it appears that economic conditions are staying in place that would accommodate a follow-up rate hike 'some time relatively soon.' The U.S. is caught up in a round of Trump-o-mania as investors and businesses (most recently members of the NFIB, an organization comprised of independent business owners) have registered strong expectations of improved times ahead. Whether these trends develop as expected or not will be a crucial factor in the Fed's policy decisions this year and will likely affect the ECB as well. But since Trump has captured the imagination of investors and altered expectations and since the Fed makes policy based on forecasts it's a pretty good bet that the U.S. will at least take another step forward on rates and test the waters. But the dollar has been strengthening on the back of anticipated rate moves and that actually undermines U.S. growth prospects and complicates policy decisions in Europe as well. OPEC's 'success' is still matter of some question. There are important things in the mix for 2017 that we can't know now, and that the OECD indicators themselves will not tell us. For the moment, we see that the OECD leading indicators are moving up month-to-month but not enough to give us a positive signal based on six-month changes. Thus, the real question, "How different will 2017 be?" cannot be answered. Will it be the year when growth finally breaks free of the gravitational forces of the financial crisis? Or will it be another year with a false break out in which the hopes of ongoing improvement are dashed by negative feedback effects, a relapse of weakness, and become a year in which rate hikes will have to be rescinded? That question is on the table for 2017. Can Trump trump the weakness and extend hope long enough to create the policy changes that will sustain stronger U.S. growth in 2017? Will OPEC prevail or fail? Will the dollar undo the best laid plans? Will a policy switch at the ECB undermine growth there? And not so incidentally, what about China: its growth and its now-outsized debt? Welcome to the main questions of 2017.